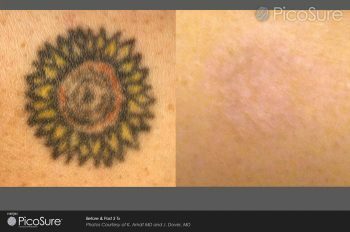 PicoSure tattoo removal works by hitting the ink particles with powerful pulses just a trillionth of a second long. These pulses pack such a massive punch that the ink, rather than breaking apart, simply shatters into particles so small they’re absorbed by the body much faster. Think of it like this: if particles treated with a laser break into boulders, those treated with PicoSure become grains of sand. This means that you’ll need less PicoSure tattoo removal sessions and get a cleaner, better result. We’re thrilled to be able to offer PicoSure laser treatment to anyone who wishes to remove a tattoo. Of course, every tattoo is different so be sure to call in for a consultation – our trained team will take a look and let you know how many treatments you may need, and what result to expect.